This specimen, the holotype, was collected from the Middle Eocene Green River Formation of Sweetwater County, Wyoming on 27 July 1967 by Frank L. Pearce. 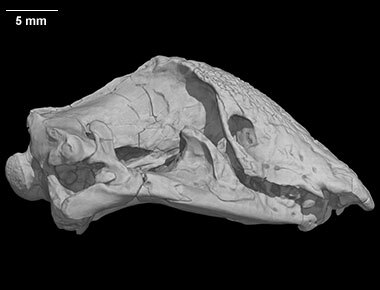 It was made available to The University of Texas High-Resolution X-ray CT Facility for scanning by Dr. Jessie Maisano of The University of Texas at Austin and Dr. Matthew Carrano of the National Museum of Natural History. Funding for scanning and image processing was provided by a National Science Foundation Assembling the Tree of Life grant (EF-0334961), The Deep Scaly Project: Resolving Squamate Phylogeny using Genomic and Morphological Approaches, to Drs. Jacques Gauthier of Yale University, Maureen Kearney (formerly of the Field Museum), Mike Lee of the University of Adelaide, Jessie Maisano of The University of Texas at Austin, Todd Reeder of San Diego State University, Olivier Rieppel of the Field Museum, Jack Sites of Brigham Young University, and John Wiens of the University of Arizona. The specimen was scanned by Matthew Colbert on 17 February 2005 along the coronal axis for a total of 750 slices. Each 1024x1024 pixel slice is 0.047 mm thick, with an interslice spacing of 0.047 mm and a field of reconstruction of 22 mm. Click here to download the original HRXCT scan data (1.0 Gb). Berman, D.S. 1973. Spathorhynchus fossorium, a Middle Eocene Amphisbaenian (Reptilia) from Wyoming. Copeia 1973:704-721. Three-dimensional volumetric renderings of the isolated lower jaw with matrix rendered transparent. Movies are 4 mb or less. To cite this page: Dr. Johannes Müller, Christy A. Hipsley and Jessica A. Maisano, 2016, "Spathorhynchus fossorium" (On-line), Digital Morphology. Accessed April 24, 2019 at http://digimorph.org/specimens/Spathorhynchus_fossorium/.